Our very own Fox Palmer met Vince Cable at the end of April. The two had discussions about school funding cuts. 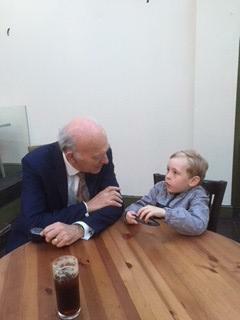 Fox then talked to Mr Cable about being on the School Council and what an important job that was. He said it was about being kind to all children and mentioned what a big responsibility it can be. Vince told Fox that being on School Council was very much like being in parliament and that you have to listen to people and represent them well by getting your points across. Well done Fox - we are all very proud of how confident and mature you are!